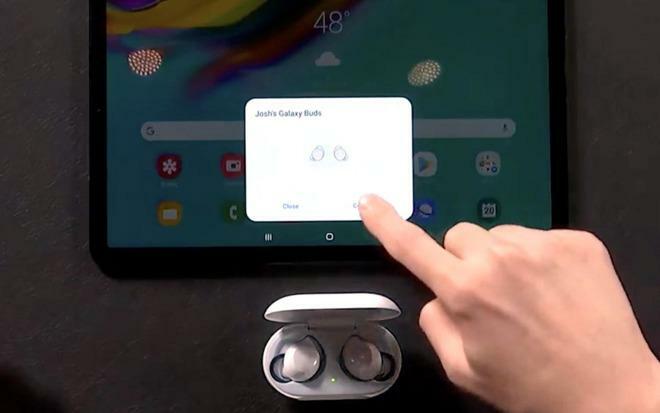 Galaxy Buds are specifically made to work with the new line of Galaxy S10 smartphones, though you aren't limited to just those. You can use these with any other phone -- iPhone included -- but you lose out on a few of the added features. 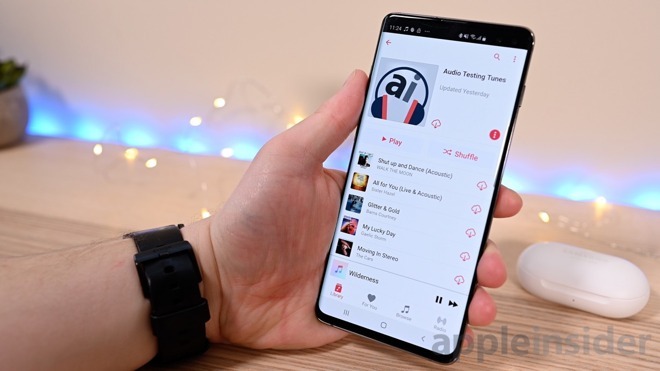 Because of that, for this review, we tried them out with our Galaxy S10+. Alternatively, you can use any wireless charger to top them off. This comes in extremely handy -- even more so when used with the Galaxy S10 phones. Being able to charge the Buds while you are out -- with no cables necessary -- is amazing. Especially since the battery is so small it won't significantly deplete your phone. After quite a bit of listening to our standard audio testing playlist (add it to your Apple Music profile above) we were ultimately left a bit underwhelmed. That isn't to say the sound is bad by any means, just below our elevated expectations. They sound very good for their price range, but certainly not above it. 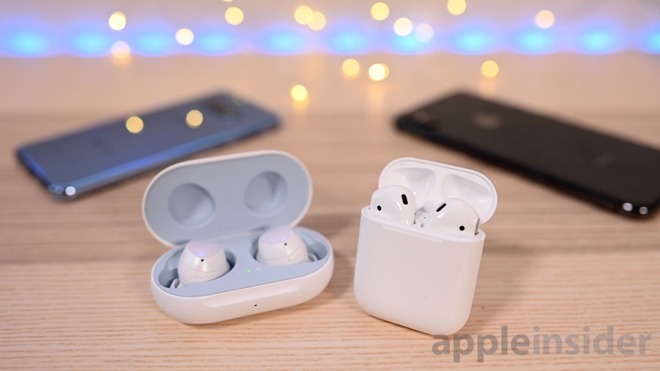 We are holding off for the full comparison to AirPods below, but as a spoiler -- yes, these do sound better than AirPods. Comparing these two headphones is tough. AirPods are iconic and wildly popular -- and had a multi-year lead. But each set of headphones has certain features that only work with their respective platforms which doesn't make it exactly a fair fight. We'd like to provide some other guidance that simply "choose the headphone that matches your smartphone." As best it could, Samsung attempted to replicate Apple's simple setup process which is a start and can possibly be refined through updates, as could the customization of the taps -- a feature Apple already allows. As we said, Samsung's Galaxy Buds started the race a bit late -- and that's the rub. We aren't comparing two phones that launched a couple of months apart. We are comparing earbuds that were released years apart. 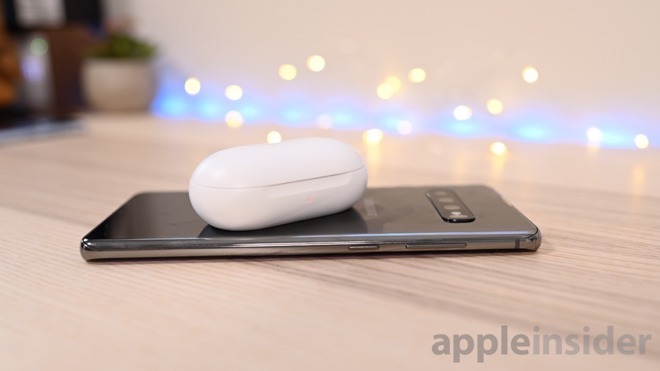 It is no surprise that the Galaxy Buds so easily bested the AirPods in so many different ways, even though there were some missteps. 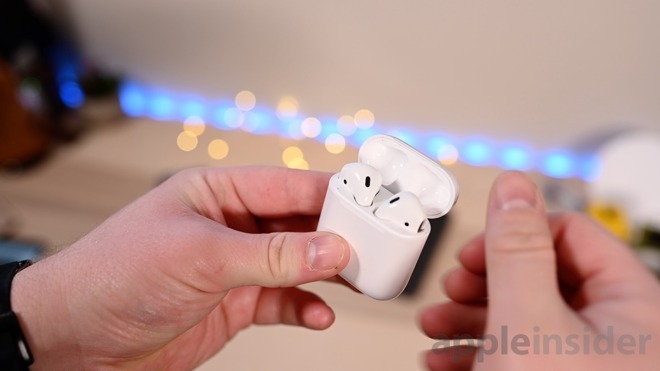 How did this AirPods wannabe get on my AppleInsider feed? Living in a mixed Android/iOS/Mac environment, I like articles that may show me what's out there without having to do all the figuring out for myself. These buds work well with iPhones, remember. 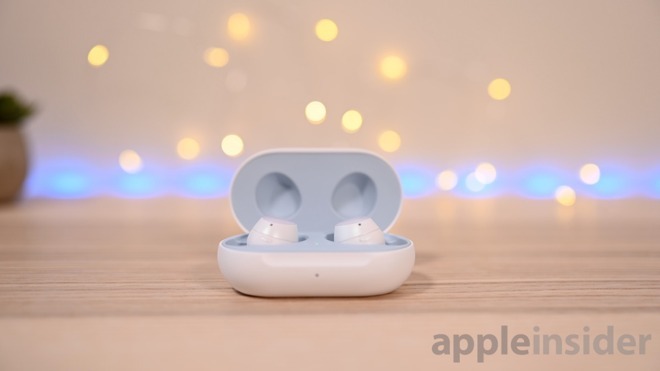 Interesting - I read a review on another (non-Apple) site that had the AirPods coming out ahead. One of the points that review made was that the microphone was better on the AirPods. Regardless the Samsung pods seem to be reasonable. As you state, you're comparing a 2019 Samsung product with a (Dec) 2016 Apple product. A better comparison would be the AirPods V2 when they arrive. Still, this is what's available now. As far as charging goes - I have been thoroughly underwhelmed by wireless charging when I've used it; wired charging is faster, more efficient and more reliable, so for me it's a useless feature. Likewise, the phone to pod charging strikes me as a neat gimmick that will be virtually useless in real life. You won't be able to effectively use your phone or the pods while you're doing it, many people have issues getting through the day with their phone battery, much less depleting it by charging their headphones, compounded by the inefficiency of wireless charging, and if you have a mat or cable to charge your phone then why not charge the pods directly? Beyond that, the AirPods case has 24 hrs of battery life, so you should rarely, if ever need anything else. It's an Apple-centric solution, but the W1 chip is a major advantage of the AirPods, imo. Dealing with bluetooth pairing and device switching is a major pain and one if the big drawbacks of bluetooth. The W1 chip significantly simplifies streamlines that process. I wish Apple would license the technology, but it doesn't appear that that's going to be the case. 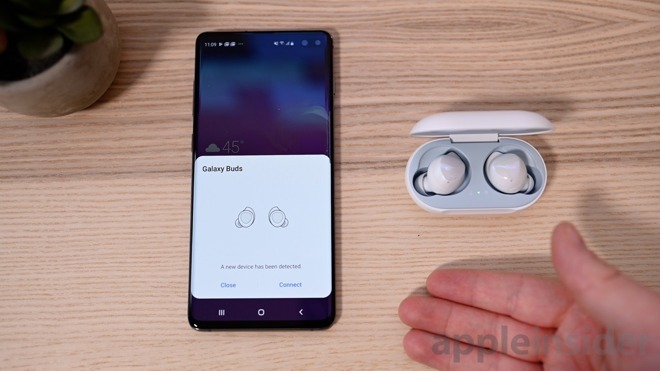 This is totally subjective, but I also think the Samsung pods look dorky - like you've got a huge hunk of cotton stuck in your ears. Finally (I gotta say it,) my wired headphones never have issues syncing, never run out of battery life, and switching them from one device to another is a breeze. They also don't use/waste lithium (and the resources used to mine it) and don't have batteries that get old mandating their replacement. Sometimes wires get in the way, but they have a lot of conveniences over wireless. Possibly a bit unreasonable to expect  to specifically address my earholes..
Wow, talk about a blatant rip-off of the AirPods! Absolutely disgusting! Companies like Scamsung and Huawei will never learn, this is their DNA; lie, cheat, steal, defraud until you get caught, then pay the fees, and rinse and repeat! Samsung rips off Apple again. Apple’s AirPods are years old and still is better and Apple is coming out with new ones soon which will leapfrog their current offering. If it weren’t for Apple, Samsung wouldn’t know what to build. That is a good point that wasn’t touched upon in the article. Can the Samsung pods switch between devices as seamlessly? I use my AirPods with my iPhone, Mac, various iPads and occasionally TV. It’s pretty common for me to use them on multiple devices each day. I would really miss that feature. I’ve personally heard a good number of people who say that AirPods won’t fit their ears. This seems like something Apple may want to address. Why miss out on sales if it’s something that could be easily rectified? Other manufacturers have done it, is there a good reason Apple won’t? Apple has Live Listen with the AirPods. Connect AirPods to phone then bring up Control Center and tap on the ear icon to toggle Live Listen to listen to the iPhone’s microphones. And why did you read it? Samsung has no shame. None. Did you watch their Apple-esque keynote? 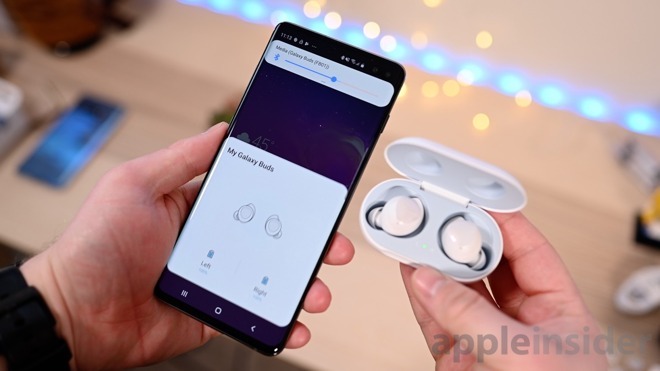 When they showed off Galaxypod pairing you'd think they were AirPods pairing with an iPad! Apple-centric features don't count. They give Apple an unfair advantage. These look NOTHING like the AirPods. use a completely different form-factor, and have features and functions Apple's product does not, just as Apple's product has a unique iconic look and Apple-specific features. How are they a "blatant ripoff"? In your haste to comment are you confusing images of the AirPods in the AI article as images of Samsung's product? The case design is dramatically similar, as well as the the OS interaction when the case opens. They even did the same "card" that pops up at the bottom of the screen with a white background. 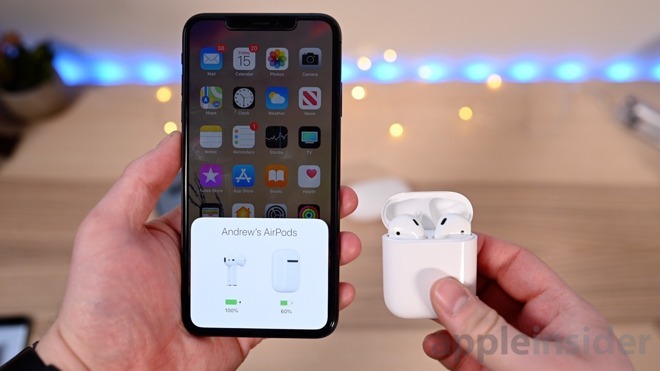 Tell me that doesn't look nearly identical to AirPods + iPhone. Sound is subjective, if AI can show that everyone in their office felt the same way about the audio quality they "might" have a point. 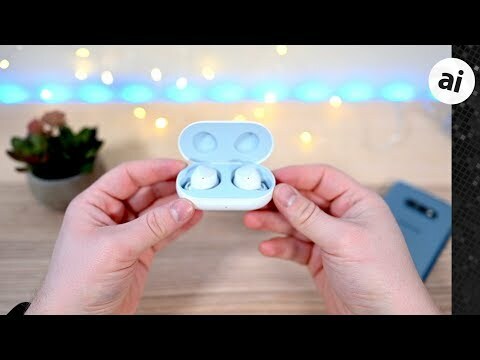 Also knowing that a new generation of AirPods is around the corner, have anything to do with this largely useless review of a product that most Apple users are not going to buy or shouldn't buy based on the Samsung copied it for the most part rip off principle.. The case design is "dramatically similar"? What cases are YOU looking at. One is upright and relatively tall and narrow. The other lays flat, is oval, and is smaller overall. Yeah, they both have software screens that are white. Gosh nearly twins! Why would we need to do that? This is Andrew's article, it doesn't have any other bylines on it. Glossed over in this otherwise-fair article is a) the sheer amount of blatant copying Samsung is very obviously guilty of — it took them nearly three years of understanding all the engineering and software breakthroughs of the AirPods to produce what amounts to a reasonable knock-off that is mostly still inferior, albeit only slightly so: and b) the very huge and significant advantage of the W1 chip both in providing a rock solid connection (very important) and vastly expanded range (maybe less important to the reviewer). As for the claim of better sound, I’m skeptical. More likely they’re a better fit for his ears — which is a legit plus for him, but not necessarily others. I’m glad Android users have a reasonable copycat that offers a fuller feature set for their platform than AirPods do for Android, but let’s acknowledge that without the AirPods, these Buds would never have existed. Samsung would never in a million years have invented these on their own — they are fundamentally a copy of Apple’s innovations. Here's the AirPods + iPad I was talking about earlier. Except this shameless image is from Samsung! Really Mike... a sole perspective is all it takes to make it better?